Le Métier de Beauté Sheer Brilliance Lip Gloss ($32) is one of my favorites. I promised to show you some of the lighter shades I purchased a long time ago. Today, I am making good on that promise. Sorry about the delay! This is a luxurious lip gloss. It's got "sumptuous, punchy color" that saturates the lips in a unique, ultra-lightweight formula, enriched with emollients and antioxidants for lips that are healthy as well as beautiful. I reach for one of my Sheer Brilliance Lip Gloss shades more often than any other lip gloss I own - and I have an incredible lip gloss collection. OK, I'm a lip gloss addict. I'll admit it. I love glossy lips. I want my lips to have some color. I want my lips to feel good. It all comes together with lip gloss. Le Métier de Beauté's Sheer Brilliance Lip Gloss is available in shades that look great on everyone. It has a a silky texture that applies with ease, leaving behind weightless color and shine. It's never sticky, which I appreciate. Once I apply it, it becomes part of me. It was September (hard to believe it's been that long) when I showed you swatches of all the lighter shades of Sheer Brilliance. I had gone to the Neiman Marcus Mazza Gallerie counter to visit with Lisa Lingis, and while I was there I swatched many colors for you. At the time, I intended to show you some of the "lighter" shades I purchased. Here are three of them, many months later. Not the greatest swatch photo, but it's the best one I got the last day we had sunshine. My photo was taken in strong outdoor sunlight. I wanted to show you a sampling of shades. At the top, Captiva shows its neutral side, but not its light peach-pink side. This shade is one I think everyone can wear. Some of you probably know that Captiva used to be gold. There are still some gold testers floating around. I like the "new Captiva" even more than the old one! Gold is easy to find. Today's Captiva is unique. The middle shade is Monaco, which is brown with just a hint of rose to my eye. This versatile shade will neutralize a flashy lipstick, making it a perfect topper for gals who don't want to lead with their lips. It looks good alone too. I wear it that way often. Combined with the pink or rose in your lips, it's a flattering shade. The bottom shade on my arm is Dubai. Rose in the tube and pink on the lips, it's as pretty in pink as it gets. I now own almost all of the Sheer Brilliance Lip Gloss shades (yes, even I have a spending breaking point - I would love to have all of them!). I wear them frequently, which is why I wanted to share. I wear La Belle or Uma Paro, two shades in the plum family, at least three days/week. One lives in my bathroom; one is on my desk at work. It's love. One of the three shades shown here is always in my handbag. You can find Le Métier de Beauté Lip Gloss at Neiman Marcus, Bergdorf Goodman, and online at Nordstrom. Some Nordstrom stores have a counter. These Sheer Brilliance Lip Glosses get my gold seal of approval. You will love them. YSL is discontinuing its Gloss Volupté Sheer Sensual Gloss Stick SPF 9 - very soon. I would guess that production stopped long ago, since its replacement is going to hit the counters in April. The replacement sounds divine, but...if you are as addicted as I am to the Gloss Stick, hoard now! Yesterday, I asked my favorite Neiman Marcus sales associate to pull every color they had left except Tangy Orange. Today, I found that Sephora has only one shade left to sell. Why don't companies warn us? If you like these fabulous Gloss Sticks, it's time to search and buy. The replacement may be stunning - and probably is. The gals in the stores have been trained, and they think it's going to wow us. I just like what I like, and I hate to lose favorites. Not long ago, I got a very nice sample from Sephora. BITE Lip Rouge ($22) is a multitasking lip color and blush, rich with buildable layers of color and a s atin texture. This lip color delivers the super-antioxidant resveratrol, which fights free radicals with potent long-term anti-aging benefits. Each Lip Rouge contains the amount of resveratrol found in five glasses of red wine (so do we or don't we ingest our liptick?). For weeks, Sephora has had an offer of a free sample with the promotion code BITE. The Geranium sample shade comes in a pot that's generous for a free sample and well worth your selection. The sample was still available last night. Now that I have a few of the samples (perfect for my purse for lip and cheek color on the go), I plan to order another shade. This is a nice tinted balm - worthy of a look-see. Here's a swatch o f Geranium, the shade Sephora sent. It's very pretty. On my lips, it's light pink. I applied the Lip Rouge with my finger and took my photo in outdoor sunlight. When I order one, I will select a shade that is slightly darker - maybe Raisin. BITE is new to Sephora. In addition to featuring beauty's hottest antioxidant, resveratrol, the all-natural ingredient list of their many lip products includes organic shea butter, superfoods, and food-grade colors, making them good enough to eat. "It's beauty that's better for you." While I am telling you about Sephora, the company just started a sample promotion. You can select five samples of skin-care products until April 5. No special code is needed. While the samples are the typical packet samples, it's a nice offer. You'll get five samples, and you can still get your BITE sample. You won't even have to look at smelly perfume samples. I'm toying with making News You Need to Know a periodic feature - appearing when I have news bytes to share ("half-posts" to combine) - so please let me know what you think. La Prairie will be launching a new Soleil Suisse Collection in May. Described as sun care for an active lifestyle by La Prairie, "the anti-aging experts," the collection of five products covers the landscape of summer needs. We got to see them at the Neiman Marcus blogger party at Mazza Gallerie. Naturally, I wanted them right then and there - and I couldn't have them. Lynn Florio, President of La Prairie, said, "At La Prairie, we've been pioneering the creation of anti-aging treatment products for over 3o years." That line now includes a unisex sun-care collection. Soleil Suisse has it all - sleek packaging and lightweight formulas perfect for active women - and men - seeking simultaneous sun protection and anti-aging nourishment for their skin. Soleil Suisse has a combination of mineral-enriched conditioners; soothing extracts; and elixirs and botanical antioxidants to take care of the skin. Here are some of the ingredients. Soothing After-Sun Mist - Face, Body ($75). The first two SPF moisturizers include porphyra umbilicalis, a red algae organism that provides antioxidant protection from environmental damage to help prevent the appearance of fine lines and wrinkles; sea water concentrate containing calcium, magnesium, iron, and zinc to balance the skin's mineral content; glycerin and sodium hyaluronate, humectants that attract and bind water to the skin; and La Prairie's exclusive Cellular Complex to stimulate the skin's natural repair process, moisturize, and energize. The Ultra-Protection Stick looks irresistible to me. The portable stick is made with porphyra umbilicalis, the red algae organism in the moisturizers; shea butter, jojoba butter, and behenyl olivate to moisturize and protect the skin's barrier; emollients and antioxidants; and that La Prairie Cellular Complex. The Gradual Tanning Lotion is a self-tanner that contains DHA and erythrulose to give you a subtle glow in hours - with no streaks. It has many of the same good-for-your-skin ingredients as the other products in the line. I'm not into self-tanning, or tanning of any kind. I'll be interested in hearing what you think if you try this one. The Soothing After-Sun Mist is enticing to me, and I'm a sun phobe. I find these after-sun mists refreshing, so I love them. It doesn't matter that I stay out of the sun. The mist is designed to calm irritability, reduce redness, and provide the same antioxidant and moisturizing benefits as the other products, while balancing the skin's equilibrium. Boerhavia diffusa root extract, a soothing agent from an Indian plant, helps diminish skin redness and sensitivity. I'm thinking it will be great for rosacea sufferers or those with skin that reddens easily. The products will be available at Bergdorf Goodman, Neiman Marcus, Bloomingdale's, Nordstrom, Saks, and La Prairie's Web site. I'll tell you more after I can get my hands on them! Sea Star Bronzing Blush from the Bronze Goddess Soleil Summer Color 2011 Collection. What a pretty blush! Estée Lauder's new Bronze Goddess Sea Star Bronzing Blush ($34) has a design that attracts and a summer color that's perfect for fair-skin types. Introduced with the Bronze Goddess Soleil Summer Color 2011 Collection - Estée Lauder always offers a nice summer collection - this piece stands out. Called a blush of endless summer, the Sea Star Bronzing Blush provides what Estée Lauder calls a shimmering, sun-kissed color to enhance your tan. The description should have been broader. Some of us don't tan, but we like to look healthy and pretty. One nice features of this compact is that you can use it as a blusher or light bronzer. I have tried using it both ways and love it. You can even wear it over your regular, matte bronzer for a light glow. For a more dramatic glow, apply to the apple of your cheeks, on your temples, and down the center of your face. It's hard to pick up just the starfish shade, although it can be done - just not with a blush or bronzer brush. I actually love the starfish shade and am willing to use a smaller applicator just to use it alone. Note to Estée Lauder: This shade would be a great blush introduction! It's easy to blend the colors across the compact. When you do, you'll get color with less pink. You can see in my swatch photo, taken in outdoor sunlight, that the overall, blended color at the bottom has a warmer, golden peach tone, while the warm pink from the starfish at the top is beyond pretty. I applied these shades with a sponge-tipped applicator to get enough color to show you in a photo. Had I used a brush, the color would have been a subtle, shaded, golden glow on my arm. The starfish is raised. I won't know how deep those pigments are until I use the product down to the base, golden peach shade. Others have found it super-shimmery; I didn't. I think it shimmers lightly. They may have had darker skin than I do, which is why I think this is a lovely summer accessory for fair-skinned types. I purchased mine at Neiman Marcus. The Bronze Goddess Sea Star Bronzing Blush should be available at all Estée Lauder counters, and it is available at the Web site. Bloomingdale's starts a gift with purchase event today. If you are interested, don't waste any time. Most years, items from the summer collections sell out quickly. I expect this year to be the same, given the conservative way the stores have been ordering stock. Laura Mer cier's latest eye shadow, Baked Eye Colour ($22) has to be sampled to fully appreciate how nice it is! By baking the powders, Laura Mercier has created beautiful, marbled shades that flatter the eyes, glide onto the lids, and provide smudge-resistant, lightweight color that lasts all day. These eye shadows are prettier on the skin than they are in the pan. There are six lovely shades. Ballet Pink (really peachy gold - or golden peach) is shown above. Black Karat (really an olive brown, but described as black gold with gold pearl) is shown at left. Violet Sky (rich indigo violet). Ballet Pink, shown above, isn't really pink on the lids. You can see in my swatch photo at right that it's a golden peach. I didn't purchase it originally because I didn't want a pink eye shadow. It's anything but. I did purchase Black Karat on the first go-round, which captured me as soon as I got it. My photo at right was taken outdoors in full sun. I applied the luscious shadows with a sponge-tipped applicator to get you a good view of the actual shades. Ballet Pink at the top is a beautiful shade that you can wear alone when you are in a hurry, as a base shade for layering, or as a lower lid color paired with a deeper color for contour. Black Karat is a complex shade, with "notes" of olive green, brown, and gold. I don't "get" the black description - other than the way it looks in the pan. There's a darker p hoto at left, included to give you a second "exposure" so that you can see how the shades might appear in different lighting. Both shades shimmer in a good way. I think they will appeal to every age group. You can apply them wet or dry. If you apply them with a wet brush, the color will be intensified. I am perfectly happy with how they look applied dry. Even though I must have enough eye shadow to sink a sailboat, I am very happy to have these two Laura Mercier Baked Eye Colours among my choices. You can see them at any Laura Mercier counter. I would advice you to try them in the store, rather than purchasing online - if you can. The colors are deceptive in the pans, and the swatch photos online are misleading. I purchased mine at Neiman Marcus. I know they are also available at Saks, Bloomingdale's, and Nordstrom. YSL Beauté has a new eyeliner that deserves your attention. The Waterproof Eye Pencil ($25) is available in six colors. There are the usual black (Black Ink) and brown (Patent Leather) shades, but there are some enticing, colorful shades too. No 3, Ultramarine, is the one that sang to me. I was equally enticed by #6, Amazon Green, but I have resisted - so far. There is a lovely lighter green, #7, Absinthe Green, and a violet shade, #5, oddly called Simmering Burgundy. I can't figure out how Simmering Burgundy got its name. These pencils apply like a dream and then stay put - for a very long time. YSL says they hold for 16 hours. I think they would stick around for days if you didn't remove them. Seriously waterproof and long-lasting, they don't budge once set. These pencils offer the look of a liquid or gel, but with the convenient precision of a pencil for application. There is not much more to say about an eyeliner pencil, except that this one, with the long-lasting and easy-to-apply jewel tones, is worthy of a look-see. I purchased Ultramarine. I love dark blue eyeliners, and they aren't as easy to find as black and brown. Here is a swatch photo of Ultramarine, taken in outdoor sunlight. Look at how pretty the blue shade is! It is lighter than navy, but not cobalt. I even see a slight tinge of periwinkle in it and perhaps a tilt toward iris. I had to have it. I am still being tempted by Amazon Green. On the eyelid, it appears teal to me (another shade I love). When you visit your YSL counter to see the new Metal Eyes Pure Chromatics Wet and Dry Eye Shadow palettes, make sure to look for these. You can purchase the Metal Eyes Collection at the YSL Web site, Neiman Marcus, and, I suspect, all YSL counters now. Rouge Coco Shine ($32) may already be old news to you - even though the only shade to have hit the counters in the United States is Boy, which was released as a special teaser in February at Nordstrom and Chanel.com. Chanel's Rouge Coco Shine, the company's newest lip colors from Peter Philips, Chanel's Creative Director for Makeup, is a fresh, delightfully sheer, and luminous new lipstick. Chanel has discontinued my old favorite, Aqualumiére, and this is its replacement. When I learned that Aqualumiére was history, I started buying any shades I could find. I liked it so much I bought shades that weren't perfect for my coloring and tastes. I couldn't imagine life without Aqualumiére. Now I can. Rouge Coco Shine is a beautiful, lasting, moisturizing, sheer, shiny lip color with an incredible lightweight texture. It is completely different from Rouge Coco, a highly pigmented lip color, and it's very different from Aqualumiére. While Aqualumiére required frequent re-application, Rouge Coco Shine is long-lasting. As the hours go by, the shine does fade, but the color stays true. You can refresh the shine with a clear gloss or lip balm - or more of the lipstick. I like everything about Rouge Coco Shine, from the slender tube to the sheer shine. This is a fabulous lipstick. I can't wait until April 6, when the full line of shades will become available at Chanel counters. I have seen them all, thanks to a sweetheart at a Chanel counter, but the only shades I have worn are those on a sample card, which I have swatched for you. My photo at right was taken in bright outdoor sunlight. I applied the shades from the sample card with a lip brush. Sorry about my reflection at the bottom. It shows Boy at the top - straight from my tube. In order top to bottom below Boy are the sample card shades: #62, Monte-Carlo; #54, Boy (again); #46, Liberté; and #57, Adventure. All but Liberté are pinks. There is a slighter darker exposure of the same shades below left. It may show the differences in the colors a little better. I have pre -ordered these (with the exception of Boy) and about five others at Neiman Marcus. I predict that some of the Rouge Coco Shine shades are going to sell out at Chanel counters in a jiffy. They will be in great demand, and the department stores never order enough of anything anymore! What do you think? Will you be buying? If you live in the DC area, Saks Chevy Chase is having a Chanel event on April 6 all day. You might want to call and make an appointment with Loyd Cassler. He is moving over to Chanel this week. Brand new from YSL Beauté, The Metal Eyes Collection offers six Pure Chromatics Wet and Dry Eye Shadow palettes ($48). Through the magic of water and a revolutionary new process, Yves Saint Laurent has pushed the limits of color with Pure Chromatics, a new generation of eye shadows. Real makeup artist magic is made easy with six emblematic harmonies that captivate the eyes. The new water-process technology employed by YSL is the company's latest discovery in color, yielding pigments that are more intense than ever before. Water does not dilute, but instead enhances the color pigments in Pure Chromatics. When used wet, the water rehydrates the eye shadows and gives full intensity to their pigments. The effect is a transformation of the satiny powder into a luxurious cream, while pearls shine with a metallic finish. These can be flashy eye shadows. I purchased #6, which is shown at left. I have to admit that the quads looked a little too outre for me when Kathy Shoreman at Neiman Marcus sent me a photo of the palettes - the second they arrived at the counter. You can see all the palette shades here. Just click on the little circle for an enlarged view. As we talked about the first palette I would try, I selected #6, even though I worried about the plum shade. Once I got a chance to try it, I was smitten - even with the "plum" shade. You'll see why below. I understand #6 quickly became the most popular of the quads as shoppers and gals working at Neiman Marcus got their hands on them. I find it interesting that it's #2 that is showing as sold out at YSL's Web site. Here is a swatch photo, taken outdoors in full sun. I applied the shadows dry with a sponge-tipped applicator. I swatched in a clockwise direction, starting at top left with the olive green shade. I find all four shades, including the one that appears very plum in the pan, enormously pleasing. Olive, gold, smoky brown-plum, and peach - there isn't a shade I won't wear. This is a stunning mixture of shades. Love it! Three of the four shades appear to be a different color in the pan than they look on my skin. In the pan, the golden shade appears to have peach in it. On the skin, it is a pure medium gold. The plum is a stunning smoky shade. Even the shade that appears to be pink in the pan is a warm, shimmering peach. I am extremely pleased with the #6 palette. I'm wondering if the other quads are deceptive at first glance. I want to get over to the store to see the rest in person. Even if I end up with only #6, I am thrilled with it. Have you seen them yet? What do you think? You can purchase the Pure Chromatics Wet and Dry Eye Shadows at the YSL Web site, Neiman Marcus, and, I suspect, all YSL counters now. I've told you I'm obsessed with Bobbi Brown's Shimmer Brick Compacts, right? I consider myself a "collector." I buy every one of them! Not too long ago, I found a little supply of Tawny Shimmer Brick (shown at left) at the Estée Lauder Company Store in Leesburg, Virginia. Snapped one up in a heartbeat. Then I found I had quite a supply of Tawny Shimmer Bricks (it would be too embarrassing to admit how many). As a result, one of you will hit the jackpot with this gorgeous shade, no longer available at Bobbi Brown's Web site or at Bobbi counters. Handmade in Italy, Shimmer Bricks are lightly shimmering, brush-on powders that reflect radiance and light on skin to create a soft glow. Tawny is for anyone who wants to give her skin subtle highlights with a warm, pinky glow. The beautiful shades in the compact can be used individually on the eyes or swirled together to create a flattering highlighter or blush for the face. How do you use it? Sweep a brush through all five shades and dust lightly on the cheekbones after applying blush - or in place of blush. Focus on applying shimmer on the top of the cheekbones, where light naturally hits the face. To add a highlight to eyes, use a small eye shadow brush to apply the lightest shade in the compact just under the brow bone. If you can wear brown-pink tones on your eyes, you can wear these shades as shadows. They impart a flattering, subtle glimmer. How can you enter to win? Here's the "fine print." Just leave a comment here once. After you comment, feel free to send me an e-mail at bestthingsinbeautycontests@gmail.com and identify your comment. You can never be too careful about sharing an e-mail address you care about on a blog, so feel free to follow this step (an alternative is to code your e-mail, e.g., myname at gmail dot com, in your comment). The deadline for entries will be Saturday, April 2, at midnight. The next morning, I will use a random number generator (random.org) to select the winner. I will e-mail the winner at that time. The winner will have 48 hours to reply to my message and provide a shipping address. After 48 hours, the prize will be forfeited, and another winner will be selected. Make sure to check your e-mail - and look in your spam folder - when the contest ends. This contest will be open to anyone anywhere in the world. I will ship the gloss uninsured (the insurance costs as much as the compact - or more - and I can't insure a small Priority box - rules, annoying USPS rules). I will also provide proof of shipping, if necessary. I am going to take a chance that both mail systems will deliver the box - yours and mine - without loss, theft, or destruction! Let's see how it works if we have an "international winner." So far, my luck with international shipping hasn't been very good. I want to keep trying because there are so many of you out there reading my blog (and I'm grateful). I've been using Natura Bissé's The Cure Sheer Eye ($115) for about a month. I purchased it after Denise Thomas, Natura Bissé Product Specialist at Neiman Marcus, sent a sample home to me via Kathy Shoreman. I quickly decided I needed it. It was a good decision. The Cure Sheer Eye is a tinted, creamy serum that contours the delicate skin around the eye (upper and lower lids) by firming it and visibly reducing the appearance of wrinkles, puffiness, and dark circles. The slight tint provides the eye area with exceptional radiance and luminosity, evening skin tone while it infuses the delicate skin with state-of-the art treatment elements. The Cure Sheer Eye is said to prolong the lifespan of skin cells thanks to the infusion of SIRT-AP, a sirtuin modulating peptide that prevents premature aging. This cutting-edge formula includes an active combination of anti-wrinkle ingredients, such as hyaluronic acid, fermentus glaciarum extract, and tripeptide-10 citrulline and tripeptide-1, which provide this delicious cream/serum with powerful anti-aging properties that help to modulate the activity of metalloproteinases (bad actors MMP-2 and MMP-3, which degrade the structure of the skin). The Cure restores the levels of young collagen and maintains the balance of collagen throughout its different cycles (production, organization, and protection). This exclusive ingredient mix mimics the skin's natural moisturizing factor, maintains the proper hydration level, and prevents dehydration, dramatically improving the texture of the skin and diminishing the visible signs of aging over time. As if that weren't enough, The Cure Sheer Eye is formulated with a "Detox Diet Complex," based on sulphorane, which stimulates the skin's natural detoxifying process in order to smooth the skin around the eye contour area. Natura Bissé has included botanical extracts of water lily, ivy, and caffeine-carnitine complex, which work together to diminish dark circles, reduce puffiness, and effectively soothe, protect, and decongest the eye contour area, while preventing the appearance of signs of fatigue. There is also a biotechnology-created extract rich in vitamin Pp (niacin). These ingredients helps to eliminate excess fluid around the eye contour area. The formula makes this eye treatment unique, but we aren't finished yet! This innovative formula includes pigments that "self-adapt" to every skin tone and diminish skin imperfections, leaving behind a luminous, even-toned, and healthy appearance to the eye contour area. When I pump The Cure into my palm to apply it, I marvel at how the color looks way too dark for my skin - and then totally morphs to work on my fair skin when I apply it. It disappears as it provides a "soft-focus" effect that creates multiple light micro-reflections, providing a luminous halo that softens dark shadows. It's absolutely amazing. I can wear it without concealer on top of it and still look polished, wide awake, and raring to go. A little of The Cure Sheer Eye goes a very long way. I have been a little frustrated that one tiny pump yields more than I need. I end up wasting some every day. That depresses me, given how much I love it. I wish I could get the knack of pumping only what I need. When a product is this fabulous, you don't want any of it going down the drain! You can purchase Natura Bissé The Cure Sheer Eye at Neiman Marcus, Bergdorf Goodman, and other Natura Bissé counters. DermaSilk sent me a few products to test. It was in the time frame of my surgery, and a friend who has been trying out new skin care volunteered to help me. I knew I had to give her the Miracle Cream ($34.99) because I saw retinyl palmitate in the ingredients. My friend Berry loves the stuff; my skin reacts badly to it. Of the products she tested, her favorite was Miracle Cream. With a proprietary blend of nine skin-restoring ingredients called Dermal Matrikine Complex, DermaSilk's Miracle Cream is an anti-aging moisturizer/treatment designed to reduce the appearance of fine lines and wrinkles, firm and brighten the skin, promote the rejuvenation of skin, and optimize the skin's natural barrier function to keep it hydrated. DermaSilk's research trials showed that Miracle Cream significantly improves elasticity and tone. The chart above shows what they found. Berry liked Miracle Cream - a lot. She said she would highly recommend it to you. Here are some of her observations. Felt a little (pleasant) tingling for a few seconds the first few times I used it. Lightweight and absorbs well, but feels really rich and moist. Continued to feel well-hydrated for hours after application. Fine lines diminished, deeper lines softened. Sometimes I find this with products in artificial light, but not daylight. With this, I saw improvement in sunlight. Fun little pump-top bottle - clear so you can see when you're running low. I like to carry a moisturizer in my purse, and this bottle traveled perfectly. If I see or feel myself getting dry in the afternoon, I pat a little cream over my makeup to feel dewy again. This worked very well for that. In short, DermaSilk's Miracle Cream was a huge hit! If you are interested in trying it, you can purchase it, along with other DermaSilk products at DermaSilk's Web site, Walgreens, Safeway, and other stores shown here. MAKE UP FOR EVER's new Uplight Face Luminizer Gel ($29) was designed to give you the sculpted glow of celebrities. Their complexions always looks fresh and glowing on screen, on catwalks, and on the red carpet. Just take a look at Jennifer Lopez on American Idol. Her skin shines - in a gorgeous way! How do the stars do it? With illuminators! Uplight enhances the points of light of the face (or body) for a natural, glamorous finish. Uplight is a silky gel that lights up the face, making your skin appear healthy, fresh, and radiant. It contains reflecting pigments that capture and diffuse light. With its extremely fluid, smooth texture, it is easy to apply - on its own or mixed with foundation - with your fingers or a brush. The texture reminds me of Giorgio Armani Beauty's Fluid Sheer, a product I adore. What's in this illuminating gel? It's oil-free; there's a lot of water (70%); it contains mango butter to hydrate; and it's enriched with pearls to capture and reflect light. Formulated for the face and body, this product adds a healthy glow to your skin that will last all day. Uplight is available in eight shades and three effects: silky, pearly, and sparkling. All you need to do is to apply a hint of illuminator in very light touches on the high points of your face - cheekbones, brow bone, temples - and blend. You will glow. I ordered two shades - sight unseen - from Sephora. I chose one that appeared to be a pink shade (#22, described at Sephora as a pearly pink flesh) and one that appeared more golden (#12, described at Sephora as dewy golden beige). I wanted to try one dewy and one pearly. When they arrived, I was thrilled. They were so much prettier in person than their little color swatches online. Now, of course, I want more of them. I am such a hoarder. Here is m y swatch photo, taken outdoors in late-afternoon sunlight, of my two shades. I applied both with my fingertips and didn't blend them into my skin. I wanted you to be able to see the nuances of the colors. The one shown at the top is #12, and #22 is shown below. The pearly finish of #22 is definitely shinier than the dewy finish of #12. When I re-order, I know I should stick with the dewy finishes, but there are only two dewy shades. I know I will order #11, even though Sephora's online swatch looks goulish. It's probably gorgeous. I would also like to try #23, described as pearly golden flesh. I think the #22 pearly pink is exquisite, and I would like to try another pearly shade. Should I act my age instead? Why start now? There are good online swatches at the MAKE UP FOR EVER site. Click on one of the little squares, and a larger, better swatch will pop up. I found them after I had received my Uplights from Sephora. These lovely luminizers are definitely worth checking out. You can order them at Sephora. 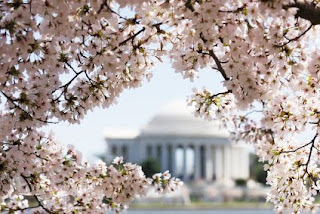 This weekend, the annual Cherry Blossom Festival gets underway in Washington, D.C. The cherry blossoms are bursting into bloom, and it's supposed to snow tomorrow morning. What gives with the weather? Is it winter or spring? As we DC-types worry about what wet snow might do to the majestic blossoms, escape with us to a beauty-full world. Givenchy has released their special Harvest Collection of perfumes for this year, and Jane has fallen for one of them - all over again. Even the limited-edition packaging is gorgeous. Head over to Daly Beauty to see it. It's time to stock up on sun protection. 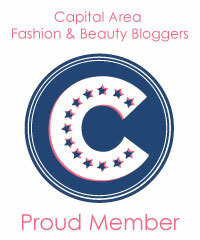 See Chelsea's favorite products to protect your skin and hair at BeautyXposé. Despite potential snow this weekend, we will see strong sun soon. Chanel's Rouge Coco Shine will be released on April 6. Some of the stores are taking pre-orders. Amy showed us swatches at Café Makeup to help us decide which ones to purchase. I'll have some swatches for you this weekend. The shades have arrived at the stores here! We just can't buy them. Sabrina featured the Burberry Beauty blushes for spring at The Beauty Look Book. Let us know if one pops onto your I-want list. Gaia showed us a gorgeous taupe nail polish from Rescue Beauty Lounge at The Non-Blonde. We agree: it's gorgeous! Not sure why feline Betty was looking the other way. Primers can make such a difference in the appearance of your skin! 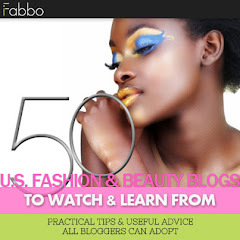 Visit Fab over Forty to find out why Kari loves Dior's Skinflash Primer. Hint - it will erase your fatigue. Want to see some horrendous plastic surgery? Debbi at DivaDebbi drew everyone's attention to a site that features botched jobs on celebrities. I went on a Le Métier de Beauté Lip Crème tear about a week ago after I fell in love with the first one I purchased. See the colors I bought - and love - here at Best Things in Beauty. If you are interested in a new lip color, you will also want to see my third round of Dior Addict purchases here. If you have been following my Dior Addict shop-a-thon, you won't be surprised that I bought another one yesterday! I hope you spend your weekend somewhere warm and cozy. No more snow! I have read so many glowing reviews of TEMPTU's Undereye Concealer ($28), I finally ordered one from Sephora. Am I glad I did! It is rave-worthy. The diamond core effectively diffuses the appearance of lines, dark circles, and any other discoloration to impart a bright, radiant, and light-reflecting look. On top of the cosmetic value, TEMPTU's Undereye Concealer is packed with vitamins A, C, E, and K, which work alongside cucumber and aloe to moisturize and smooth delicate skin, fight signs of aging, and revive tired eyes. The concealer has a creamy consistency and applies and blends like a dream - even though it's oil-free. TEMPTU did some great lab work in achieving the creamy consistency. I've studied the ingredient list and see many hydrating and protective ingredients - nice mix. I am slightly concerned (a personal issue) about the retinyl palmitate in it. My skin is extremely sensitive to retinyl palmitate. I haven't had any immediate reactions to it - and I usually do with retinyl palmitate. Because retinyl palmitate is far down in the ingredient list, I'm hoping there's not enough in an application to make my skin complain. On the nice side, there are no parabens, sulfates, or phthalates in this concealer. I had to guess on my color selection. Knowing that online swatches can be a "roll of the dice," I chose #104, Fair. There are eight shades - a thoughtful range. The lightest shade is #102, Porcelain. Since I wouldn't call my skin porcelain, I went with Fair, and it matches perfectly. That was a pleasant surprise. You can purchase TEMPTU Undereye Concealer from Sephora or TEMPTU. After I purchased mine, I found that TEMPTU's site has the best color swatches. Remember that first star magnolia flower I showed you last week? The next day, the tree burst into full bloom, with its frousy white flowers and heavenly fragrance. I have enjoyed it for a week, but I fear that we had a freeze last night. That will leave the beautiful blossoms hanging like wet Kleenex on the tree by late afternoon when I get home from work. It happens almost every year, but never fails to depress me. It wasn't the best tree choice, but I made it in 1982. I would never cut it down and start over. In most years, it has only a few glorious days before the variable spring weather frosts it. This week has flown by! I was saddened last weekend by Knut's passing; and Elizabeth Taylor's death, while not entirely surprising, left us mourning a legend. I meant it when I tweeted that her loss ended an era. She had it all, and she shared it. I think her greatest legacy will be her humanity. My mention of Sephora frustrations yesterday touched a nerve! While I continue to buy like crazy, I am not the Sephora groupie I used to be. I don't understand why the company doesn't try harder to be the company it used to be. In some cases, Sephora is the only game in town, but we can purchase much of Sephora's makeup elsewhere. When I have a choice, I now try to buy elsewhere. It didn't used to be that way. I also feel that Sephora doesn't care about my age group. The sample and point rewards are often geared to very young women. Perhaps the company's demographic data prove their average customer is 20 years old. I'm not sure why they don't try harder to please all of us - from 15 to 70. Shipping is much slower than it used to be; I miss the black pouches; I hate receiving stinky perfume samples I didn't select; and the padded envelope I received recently sent me over the edge. I think it will take a serious competitor to shake Sephora out of its complacency. The old management consultant in me would love to give Sephora some advice! How do you feel about the company? Speaking of Sephora, I received some fabulous new products this week, and I can't wait to tell you about them. One is a concealer by Temptu. I have read so many good reviews, I finally ordered one. I guessed correctly on the perfect color for me, and the coverage, texture, and blendability are top-notch. I will try to write up a feature when I get home from work. We have a great giveaway contest going. I can't figure out why there haven't been a ton of entries. There will be four prizes - all from the new bareMinerals Skincare collection, which has a two-page ad in the new InStyle. You can still enter at this link. The contest ends tomorrow night (March 26) at midnight. As Tom Pecheux's, new Pure Color Lipsticks hit the counters, I wanted to show you two pretty Pure Color Glosses ($20) I purchased. Available in 35 shades in three high-shine finishes - shine, shimmer, and sparkle - there are almost too many pretty choices! All offer sheer or medium coverage. You will want more than one. Estée Lauder's True Vision technology "transforms ordinary color and makes it extraordinary. Imagine what it will do for your lips." I think he's right! These glosses feel light (not heavy or sticky). They are drenched with conditioning ingredients. The doe-foot applicators apply the shades evenly and easily for a precisely defined look. Here is a swatch photo, taken in late-afternoon outdoor sunlight, of Magnificent Mauve at top and Mod Pink below. Both are shimmer finish glosses. I love them both. One is lightly tinted, while the other offers more color. Despite the difference in their names, I think they are both in the same brown-rose color family. They have that slight, Estée Lauder fig fragrance, but it is one I can handle. It disappears fairly quickly. These glosses (and probably Tom Pecheux as much as the gloss) won an Allure major award for 2010: Best Lip Gloss. Pecheux is a darling of the beauty industry. He is totally revamping a brand many had given up as their "mother's makeup." You can find Pure Color glosses everywhere! Most major department stores have an Estée Lauder counter. There's a free gift with purchase right now at the Estée Lauder Web site. Josie Maran Argan Cleansing Oil ($32) has quickly become one of my favorite oil-based cleansers. This gentle, all-natural cleanser is extremely effective, removing my makeup and every trace of my mascara in a pleasant, easy wash. To my nose, it has a delicious, light citrus scent. This multitasking cleanser removes makeup and skin impurities (i.e., environmental grime and dirt) while providing deep hydration. The non-greasy texture leaves the skin feeling moisturized, not tight or over-dried. The first ingredient on the list is argan oil, followed by an impressive list of natural and organic oils that include almond, safflower seed, grape seed, and grapefruit peel oils. The oils effectively cleanse the skin's surface and renew the skin. The grapefruit peel oil has to be responsible for the luscious scent. Sephora, the exclusive retailer for this cleanser, says this product is ideal for all skin types. I can tell you that my dry skin loves it. Argan oil is an effective natural cleanser, restoring the skin's natural moisture and pH balance. It is produced from the argan tree in the arid lands of Morocco. Rich in vitamin E and essential fatty acids, this organically grown ingredient is known to prevent skin dehydration, inflammation, hyperpigmentation, and excess production of sebum. Naturally, as with other Josie Maran products, Argan Cleansing Oil is formulated without a lot of the not-so-nice ingredients we like to avoid. One of my favorite features of cleansers is a pump dispenser, and Josie Maran has obliged with an easy-to-use pump that requires no struggling. The box says to rub 3-4 pumps of the oil into dry hands and apply evenly over the face. Then wet the face and massage the oil into a rich milk. To remove it, rinse with water. It slides off very easily, leaving my skin feeling hydrated and clean. What more can you ask? Josie Maran's Argan Cleansing Oil has a much nicer price point than some of the other cleansing oils I use. I highly recommend it. You can find it at Sephora, where it has Sephora's natural seal. Now, if Sephora would just put up a heart-stopping 500-point or 1,000-point reward, I would be a happy customer. I've been building points for so long, my total is getting ridiculous. I don't want glittery eyeliner, men's products, and skin-care samples that aren't right for me. Even their free samples have been pretty boring (obnoxious fragrances galore), but you shouldn't really complain about free. While I'm whining about Sephora, I didn't like the padded envelope in which my last order arrived. Who likes to pay full price for squished boxes? Sorry, Josie. Not your fault! Can you believe there's a Part 3 to my Dior Addict story? The new formulation of Dior Addict ($28) has captured my heart - and my wallet. You can peruse my first feature at this link and my second at this link. There are swatches of my first two rounds of purchases at these links. In the comments of my Part 2 feature, Al told me that Sephora had just added more shades. Off I went to explore them. Naturally, I ordered a few more - four to be exact. Inspired by the cutting-edge runway fashions of Dior, this hydrating formula dresses the lips with a veil of "addicting color" and spectacular shine. What I love is their sheerness - pretty color without a lot of pigment. I'm a pushover when it comes to sheer lip color! I don't need to use gloss over Dior Addict - a bonus for pretty lips in a hurry. They feel good too. On my latest order, I purchased these shades, listed here with Sephora's descriptions. I was thrilled with them when they arrived! Even though the color swatches at Sephora weren't entirely true, the lipsticks are all gorgeous. Here is a swatch photo, taken outdoors in full sun, that shows the shades in the order listed above. Representing different color families, they are all exquisite! Despite the number of Dior Addict shades I now own, I am thinking of ordering even more. Do you think I need an intervention? These lipsticks have been a Sephora exclusive. They will arrive in the department stores soon (the launch month is April). I haven't been hanging out at the department stores lately to know if they have started to appear at Saks, Neiman Marcus, Nordstrom, Bloomingdale's, or other counters. When they do, grab at least one! I've been in a bronzer kind of mood. Maybe it's because summer will be upon us before we know it. Maybe it's because I am always impressed with the year-round contouring power of bronzers. They can make your cheekbones pop. Whatever the reason, I saw Shiseido's Oil-Free Bronzer ($35) at Sephora online and ordered it right away. I love everything Shiseido. This pressed powder, oil-free bronzer creates a natural, radiant, sun-kissed look. Its formula ensures a perfectly even, natural, air-brushed finish. For those who find that oil in beauty creates a problem for their skin, this bronzer should be a delight. It's available in three shades: Dawn Light, Desert Rose, and Dusk. All three looked gorgeous in the color swatches at Sephora, but I ordered Dawn Light. I know that the others - despite their beautiful tones - would probably be too dark for my fair skin. I still plan to play with them when I go to a department store that carries Shiseido. This is a short feature because there's not much more to tell you than, "I love it." The compact comes with a brush (nice touch) that is separated from the bronzer by a plastic insert. The color works nicely for me. Even though I swatched it using a sponge-tipped applicator to get a saturated rendering of the shade, it looks pretty, natural, and sheer on my face when applied with a powder or blush brush. I haven't used the little brush that comes with it, but I could. It's nice. Here's a swatch photo, purposely created with a dark, heavy application to the left of the swatch, fading to a lighter application at the right. My photo was taken outdoors in full sun, accounting for my shiny skin. This bronzer is not sparkly. I hope you can see that. The soft, airy texture is perfect, and it applies and blends with ease for an air-brushed look. It's an excellent bronzer for anyone who wants a bronze tone that appears extremely natural. While I can only testify to Dawn Light, I know Shiseido so well now, I can predict that the darker shades are equally gorgeous. When applied with a brush, it leaves a warm tone on my fair skin without making me look like a mud puddle. In fact, the bronzer, when applied with a blush brush is barely discernible as a bronzer, which is fine with me! I don't want people to look at me and think I am wearing a pretty bronzer. I want them to look at me and think I look good - healthy. As always, I am delighted with my Shiseido purchase. You can find this lovely bronzer at Sephora, Macy's, and other Shiseido counters. Alima Pure's new Rainforest Collection ($30) has four winning jewel-toned shades that will make your eyes the center of attention. I was introduced to Alima Pure last fall. Ever since, I've grown to love their makeup - even though I don't consider myself handy with loose pigments. Historically, I've found mineral pigments a little messy. Maybe I'm a klutz. Those of you who are hooked on M·A·C pigments or other loose powder makeup (e.g., Bare Escentuals) won't find these pigments hard to use at all. With a little practice, I've improved my technique so that I can apply the makeup to my face without leaving a trail in my bathroom sink. I'm proud of myself! Because Alima Pure's pure colors and mineral pigments are so rich and long-lasting, you don’t need much powder to do a beautiful job. That's why it was, for me, simply a matter of learning to pick up just the right amount of powder on my brush. Alima Pure makes its mineral makeup using only the purest cosmetic-grade mineral pigments. There are no additives, fillers, or fragrances that can irritate your skin or clog your pores. In fact, the natural mineral pigments Alima Pure uses are actually good for your skin, providing sun protection and helpful anti-inflammatory properties. A couple of weeks ago, Alima Pure sent me samples of the Rainforest Collection, four gorgeous eye shadows in rich, luscious colors. They introduced Rainforest in honor of Earth Day to pay homage to the "jewels of the earth," our wild, delicate, ridiculously beautiful, and endangered rain forests. This luxurious, completely natural set of four eye shadows is packaged in a lovely box made from 37% recycled content (completely recyclable - but you'll want to keep it). Here are the shades. There are no throwaways in this collection! The Rainforest Collection will be available for a limited time. What's really nice, beyond the makeup, is that $2 from each collection sold will be donated to the Rainforest Action Network. I love it when my indulgences benefit a charity near and dear to my heart. I swatched the shades to show you how magnificent they look on skin. I swatched them very heavily, using a sponge-tipped applicator, so that you could see the richness of each color in the collection. I have been wearing them in a much more sedate manner, applied lightly with a brush. Yes, I'm conservative, but you don't have to be! My photo was taken outdoors in full sun. Every time I look at these colors - on my bathroom counter, on my eyes, and in my photos - I get excited. They are undeniably pretty. From top to bottom, the colors in the photo are Kapok, Macaw, Jaguar, and Bromeliad. Rich, shimmering (some of that shimmer in my photo is sunlight), and trendy, this collection is a must-have - and so affordable. Alima Pure has a great Web site, filled with information, and their blog is interesting (a great discussion of natural health and beauty). They also have a Facebook site and a Twitter account. Check them out - you won't be disappointed. This is mineral makeup a makeup snob can love! Now, here's a really cool offer. I had planned this feature last weekend, but I found out today that Blissmo is starting a promotion featuring Alima Pure this Thursday, Marcy 24, 2011. They will be offering a 50% discount voucher good for the entire Alima Pure product line. For Best Things in Beauty readers, they will offer an additional 5% off if you use the code "trybliss" in the Reference Code box to the left of the checkout page on Blissmo's Web site. With this code, you will receive 55% off the Alima Pure promotion, rather than the 50% off given to everyone else. I plan to take advantage of that offer! I think it's a one-day promotion, so don't waste any time. What do you think? Isn't the Rainforest Collection gorgeous? In February, I told you about Bobbi Brown's new super-hit lipstick, Rich Lip Color SPF 12 ($22). I've bought five of them since then. I love this lipstick. It's vying for my favorite full-color lipstick for spring. When we went to the blogger party at Neiman Marcus Mazza Gallerie, my lovely Bobbi Brown friends gave me a color that was about to debut, Sweet Nectar. She also gave one to Elvira at Pink Sith, where you may have seen Sweet Nectar featured. Now, you can buy Sweet Nectar, and if you want to build a coral spring - the color of the moment - you should seek it out. The color in the tube is close to the shade shown above left, taken from Bobbi Brown's Web site. To my eye, the tube portrays a shade that is a bit darker and more coral - and intriguing. Rich Lip Color SPF 12 is lightweight, but intense. Hard to believe that those two contrasting adjectives apply, but they do. Bobbi's latest formula combines pigments with a clear base to deliver pure, crisp color with just one swipe. Plus, it's creamy and moisturizing, so lips feel as good as they look. Rich Lip Color is available in 13 beautiful shades. Here's a swatch of Sweet Nectar at right, taken in outdoor sunlight. Normally, coral lipsticks aren't my best shades. Maybe they are too warm for me; maybe I just can't get used to them; maybe they remind me of the orange shag carpet I had in my apartment when I was in graduate school. I shudder when I remember that shade of the 70's. Sweet Nectar looks good on me! Combined with the pink of my lips - and with just a hint of pink that doesn't show in my swatch photo - it warms me up without overwhelming me. I'm really glad to have it - another option for this color lover. I love Bobbi Brown's new Rich Lip Color, and I'll bet you will too. While Lilac continues to be my favorite among the gorgeous colors, I wanted to introduce you to Sweet Nectar. I can't always show you pink and peach lipsticks! You can purchase Rich Lip Color SPF 12 at Bobbi Brown's Web site, Neiman Marcus, Nordstrom - any Bobbi Brown counter. If you haven't played with the new Rich Lip Colors, you should. They are a treat. I sold Douglas Hannant de Robert Piguet today, just by wearing the Eau de Parfum ($85). This luscious signature fragrance was created by womenswear designer Douglas Hannant in collaboration with Robert Piguet Parfums. Inspired by the sophistication of haute couture, the fragrance is a light floral that is modern, clean, and fresh - and seductive. I doubt I need to recount the story of Fracas, created by Robert Piguet, to any white flower fragrance fan. The legendary Fracas, developed in the year of my birth, is still enormously popular today. It is strongly tuberose, with accompanying notes of bergamot, mandarin, jasmine, gardenia, jonquil, (and I've read Bulgarian rose and orange flower), drying down to base notes of musk and sandalwood - floral notes I adore. That makes it all the more strange that I have never been a Fracas lover. I can't explain it. There's just something about Fracas that never caught on with my heart, like Joy did. Perhaps it's because I never smelled the original, but instead have tried the modern version, not exactly true to the original, but supposedly formulated with non-allergenic materials. I find Fracas harsh. Now, though, I am totally smitten with what I now call "Fracas Light" with love. Douglas Hannant de Robert Piguet is so gorgeous that when I wore it to work today, a colleague came into my office marveling at how good it smelled. Given that she has mistaken my own fragrance for my diffuser in the past, I had her get up close and smell me. It was on her second, "Can I have another whiff?" that she decided she needed it too. This fragrance sells itself! I should be getting a commission from Neiman Marcus (LOL - they are plenty good to me). 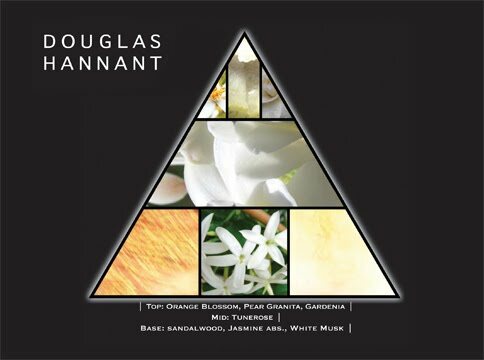 Douglas H annant, in its elegant black bottle, has top notes of orange blossom, pear granita, and gardenia. The mid-note is tuberose. The base notes are sandalwood, jasmine, and white musk. The overall effect is a white floral that is enticing, intoxicating, and seductive. It ropes you in. If you love white flowers, you are going to love this scent, one of a group of fragrances exclusive to Neiman Marcus, Saks Fifth Avenue in New York, Henri Bendel, the Robert Piguet Web site, and a few other sources, such as Selfridges (England), Printemps (Paris), and Le Bon Marché (Paris). I think Bergdorf Goodman has them too. I will tell you about the sister fragrances sometime soon. For now, I think you need to go smell this one! It's divine. I'm gushing. I can't thank Kathy Shoreman - Neiman Marcus super-SA - enough for telling me about this beautiful addition to my fragrance collection. I may need to purchase the more expensive parfum, which can take its place next to Joy (a classic I'll always wear) and the Eau de Parfum at my house. After spending time with Dustin Lujan last weekend and purchasing Fraise Crème Lip Crème, I decided I needed more Le Métier de Beauté Lip Crème ($36) colors. To recap, I had never bought a Lip Crème gloss before last weekend! I always selected the company's Sheer Brilliance Lip Glosses, so I was game for something new. That "something new" became an obsession. Kathy Shoreman and Lisa Corsino at Neiman Marcus Tysons Galleria helped me select some colors over the phone. They know what I like. I purchased three more - all rather different - so that I would have a nice sampling of Lip Crème: Café Crème, Papaye Crème, and Framboise Crème. Lip Crème is hybrid between a gloss and a lipstick. The formula offers a more intense color pay-off and creamier texture than regular lipsticks and more shine and gloss than most lip glosses. It leaves a lacquer-like sheen finish that's amazingly attractive. Lip Crème combines chic color, intense emollients, and antioxidants and vitamins to soothe and nourish the lips. Here are two swatch photos, taken at the same time, but in different outdoor light. Each Lip Crème was applied heavily with its own doe-foot applicator. In both photos, they are shown in this order: Papaye Crème at top left, Café Crème at top right, Framboise Crème at bottom left, and Fraise Crème at bottom right. The photo at right was taken in direct sun, and the one below left was taken in strong light. What I hope you can see in both photos is the luminosity and complexity of the shades. They sparkle. Kathy and Lisa talked me into Papaye Crème, which looked very peachy online. I wasn't sure I needed another peach lip color. While it is peachy, they we re right; it was too pretty to pass up. I had selected Café Crème because it appeared online to be a rose-toned brown, one of my favorite shades. It is a little more brown than rose, but I still love it. Framboise Crème, the darkest of the four, is raspberry red, a color I feel I must use sparingly. I think it's so beautiful, I'll try to get used to having darker lips. You know I love Dustin's selection, Fraise Crème, a warm rose with a hint of coral that lights up my face. Lip Crème is a nicely long-lasting lip color. I have been wearing it without lipstick underneath, and I've been delighted with it. I love what I call full-coverage lip glosses, so I'll be on the prowl for more shades. Please let me know if you have a favorite you think I would like. You can purchase Le Métier de Beauté at Bergdorf Goodman (where you can usually find Dustin), Neiman Marcus, and some Nordstrom stores. It's also available online too. New for Spring 2011, Josie Maran's two-shade Argan Blend Concealer ($28) provides long-lasting, repairing coverage that hides imperfections while hydrating the skin with Josie’s signature ingredient, organic argan oil. The dual shades are intended to work together to correct and conceal flaws and highlight skin tone, helping women address the appearance of lines, wrinkles, and discoloration, while concealing dark circles, blemishes, age spots, and redness. You probably know that argan oil - a hot skin care and hair care ingredient - is produced from the argan tree from Morocco. The oil is rich in vitamin E and essential fatty acids, which have anti-aging properties. This organic ingredient is known to help and prevent dehydration, inflammation, hyperpigmentation, and sebum production. It's the basis for Josie Maran's fabulous line of beauty products, many of which I love. Argan Blend Concealer is a very nice, creamy, long-lasting concealer. I have only one problem with it. The lightest color duo is too dark for my skin. It's available in three color combinations, Sand (light), Suede (medium), and Chestnut (dark). I purchased Sand from Sephora online. The concealer duo has two shades, one yellow-based and one pink-based. You can use them alone or mix them - theoretically to customize a shade that's perfect for your skin tone or the place on your face where you need concealer. With Sand, both shades are too dark for my skin, and they are no lighter when mixed. It's not going to be easy for you to see that in my swatch photo. I applied the shades with a sponge-tipped applicator to try to show the shades adequately. At the top - if you can see it at all - is the yellow-toned shade. The pink one is in the middle. A mixture of the two is shown at the bottom. My photo was taken in full sun. The yellow shade is very yellow. The pink one is very pink - almost unnatural. Mixed, they are no better on my skin. It's really too bad because I like the texture, consistency, and blendability of this concealer. I prefer concealers that are just slightly lighter than my own skin tone because they brighten while they conceal. When a concealer is too dark, it draws attention to the areas I'm trying to conceal, making them look muddy. I wish Josie Maran had introduced a color that would work for us extremely fair types. If you are interested in Argan Blend Concealer, don't buy it online, sight unseen like I did. Go to Sephora and test it to make sure one of the three shade duos will work for you. You can also order Argan Blend Concealer online from Josie Maran's own Web site. Finally - a dietary supplement that tastes so good I look forward to chewing it! Resveratrol Age-Revitalizing Fruit Chews ($19.99) from ResVitále are little, individually wrapped chewies that are packed with resveratrol in an amount equal to 60 glasses of red wine! I can chew a little candy and get all the benefits of my favorite French red wines without spending over $100/bottle! We've all heard that red wine contains resveratrol, a powerful polyphenol found in the skin, seeds, stems, and vines of red wine grapes, which has significant antioxidant properties. Resveratrol is thought by many to explain the "French Paradox," the fact that the French have a remarkably low incidence of heart disease compared to Americans, despite a diet rich in butter (thank you, Julia Child!) and other fatty foods. Actually, the fact that French people walk much more than Americans may be another significant factor. The level of obesity in the United States, particularly among children, is a frightening health crisis. I'm going to get techie on you for a few moments. Harvard University biochemists believe that resveratrol turns on the sirtuin gene, also known as the SIRT1 longevity gene. By activating this gene, scientists believe resveratrol mimics the effects of caloric restriction, which is thought to slow the aging process by limiting dietary energy intake. Resveratrol is also thought to slow many of the degenerative effects associated with aging and may potentially increase life span. Some of these health benefits may include protection from Alzheimer's, arthritis, cardiac disease, and certain forms of cancer.Trans-Resveratrol, the bioactive form of the resveratrol polyphenol, has been proven in clinical studies to activate SIRT1 and enhance cellular productivity. Trans-Resveratrol has also been shown to increase the number of mitochondria in cells, thus increasing energy capacity and enhancing sensory-motor function. Researchers at the University of Rochester Medical Center used resveratrol to aid in fighting pancreatic skin cancer. One article published in the respected journal Science recounted a peer-reviewed finding that resveratrol may be a potential cancer preventative. It has also been found to inhibit tumor growth, mitigate the effects of a high-fat diet (published in Nature), and may even protect against radiation exposure! Just Google resveratrol if you would like to learn more. Contain antioxidant-rich superfruits for serious anti-aging defense. I have read Dr. Perricone's writings on superfruits, which are rich in antioxidants, and I was already sold on the concept. In fact, I've eaten more blueberries in the last few months than at any other time in my life. Unfortunately, it's recommended that you eat only one of these little sweets every day (you can have two for "advanced cellular protection"). They are a bit addictive like other fruity chews. Each has only 20 calories, so that shouldn't be a consideration. They leave a slightly sweet aftertaste (like drinking red wine without the alcohol), but cause absolutely no heartburn or "wash-back" the way some dietary supplements do (to me, at least). Because they are individually wrapped, you can take them along easily. I popped a few in my handbag for the mornings when I leave home without consuming my Resveratrol chew. I like them - a lot! I'd love to be able to tell you that after chewing them for a few weeks I began to look 35 again. Despite what some might think, I'm not crazy. What I do believe is that I'm taking steps, backed up by science, to protect my body, and that makes me feel good. It also makes me feel just a little less guilty when I indulge my cravings for pepperoni pizza, great hamburgers, well-done french fries, and the carbs in my life. Head over to ResVitále's Web site to find out more about their diverse product line and how to order. If you have a GNC store near you, you can find their products there. Happy Saint Patrick's Day! Let's Go Green!